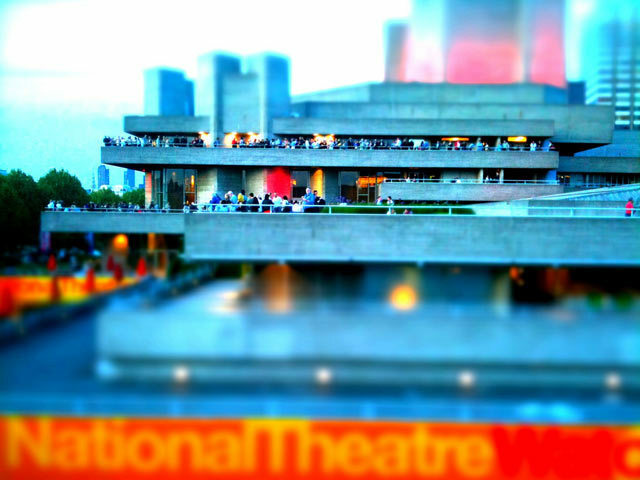 The National Theatre's free Watch This Space Festival starts this week. Image by Kim-Leng via the Londonist Flickrpool. Tonight: Take a trip to Forest Hill for the Horniman Museum late after work. Open between 7-9pm, documentary The End of the Line will be screened in Gallery Square with a Q&A featuring Aquarium staff after. Friday: Bow Arts Trust begin their Open Studios weekend this evening from 6.30 till late with over 100 artists participating. Get a ticket to have a go at contorting yourself through LaserTrap at Future Gallery, £5. The second day of Greenwich and Docklands International Festival builds up to a spectacular event in Greenwich Park at 10pm with Sufi-Zen, fusing Asian dance and environmental art. Oh, and fire. Saturday: The Bank of England allows you behind the scenes today for Open Door, part of the City of London Festival. Guided tours every half hour, free. The Museum is also open and also free. Down Lambeth way, visit Woodfields Summer Fair on the edge of Tooting Common between 11am-5pm. Jump on the Big Dance Bus in Walthamstow Town Square from 2pm with dance performances and the opportunity to learn some new moves yourself. Free. There's a summer picnic in Richmond at Pensford Field between 11am-4pm. Pack scotch eggs and chill out to live acoustic music in this nature reserve. Do we know everything yet? Join the discussion at Cafe Scientifique in the Front Room at Queen Elizabeth Hall. Free, 5.45-7.15pm. Part of the Festival of Science and Arts. Sunday: Take an Olympic walk with the London Festival of Architecture. Meet 1030am, Stratford Station. For radio controlled bins, stilt walkers and an industrial waste orchestra pootle to Waltham Forest Green Fair at Lloyd Park in the fields between 1-6pm, free. Footie fans can watch the England match outdoors in Walthamstow Town Square. Drop into the Truman Brewery, Brick Lane for Europe's biggest graduate art fair Free Range, this week focusing on 'New Blood'. 10am-7pm, free. Monday: Nathan Coton previews his Edinburgh show "Breakfast at Stephanie's" at the Camden Head, NW1 7pm, £3. Tuesday: Take a walk around the Pool of London with CABE as part of LFA2010. Meet Hays Galleria, 6pm, free. Wednesday: Your last chance to see the Grant Museum in its current space before every bone, beetle, and brain is moved across the road. Skive off work and drop in during the special extended opening hours, to wave goodbye to your favourite specimen before it joins the long journey in Grant's Ark, 10am-5pm. Join the Big Ideas talk "Do Thought Experiments Tell Us Anything?" free, at the Wheatsheaf, 8pm. Help keep London thrifty - let us know about cheap and free events happening in your hood. Email tips@londonist.com, leave a comment or tweet us @londonist. And please do let us know if you follow up on our cheap suggestions - were they any good?